VMF-214 was commissioned early in 1942 at Ewa on the island of Oahu in the Hawaiian Islands. InAugust of 1943, 27 young men under "Pappy" Boyington's leadership formed the original "Black Sheep" of VMF-214. In the early part of World War II, from island to island in the South Pacific, there occasionally cropped up flyers who were unattached and who were separated from their squadrons by reason of illness or breakup of their organizations. They had been left out of it somehow in the shuffle and had no way to get back into the fight. Some were veteran combat pilots with several kills to their credit; others were pilots newly arrived from the United States as replacements. All were eager to join a squadron and see action against the Japanese, but their efforts were met with refusals and orders to sit and wait. This was the situation at Espiritu Santo, New Hebrides, when finally the persistent campaigning of Maj. Boyington and Maj. Stan Bailey (who was later named executive officer) was rewarded when wing headquarters gave them permission to form the stragglers into a squadron, with the understanding that they would have less than four weeks to mold themselves into a fully trained, completely coordinated Marine squadron. This was accomplished by flying every day and night with their eight Corsairs. The "Black Sheep" fought their way to fame in just 84 days, piling up a record 197 planes destroyed or damaged, troop transports and supply ships sunk, and ground installations destroyed in addition to numerous other victories. 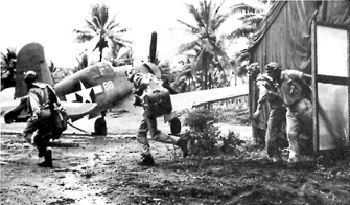 They flew their first combat mission on September 16, 1943, escorting Dauntless dive bombers to Ballale, a small island west of Bougainville where the Japanese had a heavily fortified airstrip. They encountered heavy opposition from the enemy Zeros, and Pappy claimed five kills, his best single day total. In October VMF-214 moved up from their orginal base in the Russells to a more advanced location at Munda. From here they were closer to the next big objective -- the Jap bases on Bougainville. On one mission over Bougainville, according to Boyingtons autobiography, the Japanese radioed him in English, asking him to report his position and so forth. Pappy played along, but stayed 5000 feet higher than he had told them, and when the Zeros came along, the Black Sheep blew twelve of them away. (The absolute veracity of Boyingtons autobiography is not certain, but thats how he told the story.) One night with a quarter moon, he went up to try to deal with "Washing Machine Charlie," but without results. After being decommissioned at the end of World War II, VMF-214 was recommissioned in 1948 and spent most of its time aboard various carriers operating in the waters off the West Coast of the United States, training Marine pilots for carrier operations. At the outbreak of the Korean Conflict, VMA-214 was again given short notice to "get ready." By August of 1950, the Blacksheep were aboard the USS Sicily Strait, en route to Korean waters and into the fight. Another chapter in the illustrious history of the Blacksheep squadron was being written as the "Fighting 214th" was the first Marine squadron to see action in Korea. In January 1956, the Blacksheep again received the order to "get ready." This time, however, they were given more time to prepare. In the ensuing 15 months, all aspects of Marine aviation were covered by the Blacksheep of the newly designated Marine all-weather fighter squadron. Jan. 23, 1962, saw the Blacksheep turn another page in Marine history when their FJ Fury jets, the last in an active Marine squadron, were flown away. In their place came the squadron's first A-4 Skyhawks. In 1965, VMA-214 flew attack missions in support of the III Marine Amphibious Force and the Republic of Vietnam in South Vietnam. The squadron remained in Vietnam for eight months and flew 3,971 combat missions totaling 5,274 combat hours. In February 1966, the Blacksheep rotated out of Vietnam to pick up new pilots and personnel. In May 1966, '214 returned to Chu Lai, Vietnam, where it again flew combat missions in support of operations in Vietnam. VMA-214 returned from Vietnam for a final time in April 1967. The Blacksheep flew 14,000 hours in combat, 13,200 sorties, and dropped more than 10,000 tons of ordnance. August 1969 saw the Blacksheep in Nevada, flying 453 sorties and dropping 77.5 tons of ordnance in 11 days. From 1971 to 1979 the Blacksheep deployed on numerous occasions to China Lake, Kadena, Iwakuni and Korea. The A-4M Skyhawk has a payload of 8,000 pounds of ordnance, including, a 20mm cannon and Sidewinder air-to-air missiles. June 1986 marked the third accident-free year for VMA-214 and 15,000 accident-free hours. The Blacksheep also demonstrated an impressive record of operational readiness for those three years in seven deployments to NAS Fallon, Nev.; Hill AFB, Utah; Luke AFB, Ariz.; MCAS Yuma, Ariz.; and Twentynine Palms, Calif. From December 1986 to June 1987, the squadron was deployed to the Western Pacific taking part in exercises at Iwakuni, Kadena, Cubi Point, and Pohang, Korea. In September 1987, VMA-213 relocated from MCAS El Toro, Calif., to MCAS Yuma. January 12, 1988, was a sad day in the history of the Blacksheep Squadron. Its famous leader, Gregory "Pappy" Boyington, whose combat exploits were dramatized in the television series "Baa Baa Blacksheep," died of cancer at 4 a.m. at the age of 75. In June, the Blacksheep left another deployment to WestPac, before returning to Yuma in December. 1989 was another historic year for the squadron. The Blacksheep were the first A-4 squadron to fly 30,000 accident-free hours and achieved six years accident-free flying. The squadron retired the A-4M Skyhawk in June and formed the first night attack squadron with the AV-8B Night Attack Harrier, marking another milestone of the world famous Blacksheep. The squadron completed the first overseas deployment of the Night Attack Harrier to Iwakuni, Japan, in 1992. The nickname Black Sheep Squadron originated at a unit party during the first days at Munda. Since they had been thrown together so hastily from replacements, the pilots decided to call themselves "Boyington's Bastards." Frank Walton, the squadron's intelligence officer, was told the next day by a Marine public relations officer that the nickname would be unacceptable for newspaper accounts, so the fliers called themselves the "Black Sheep." As Avey explains, the name was not chosen to imply rebellious nature. "We were not raucous or anything. We were just looking for a name." Because the 31-year-old Boyington was at least 10 years older than most of his pilots, they started calling him "Pappy" or "Gramps." "The Black Sheep started as a squadron of nobodies, being formed from a collection of flyers and replacements on the spur of the moment....Within a matter of weeks it became the best Japanese-killing outfit in the Solomons and, in some respects, the most unusual squadron ever to fly the South Pacific skies." Marine Attack Squadron (VMA)-214 is currently one of four AV-8B Harrier squadrons assigned to Marine Aircraft Group-13, 3rd Marine Aircraft Wing. Its mission is to provide close-air support, conduct armed reconnaissance and limited air-defense for Marine expeditionary forces.